attended a film screening of Shadow World, followed by a discussion with authors and screenplays Andrew Feinstein & Paul Holden, artist and musician Lowkey, and writer and cultural attaché of the No Glory in War campaign, Jan Woolf. The film introduced many to the extent of the various (and often hidden) dimensions on the arms trade, and provoked discussion on what could be done in light of this uncovering. To book a screening and talk with Andrew Feinstein at your university, please drop us an email. On Thursday 8th November, we spoke and contributed to a panel on ‘Peace Activism’. The discussion aimed to dismantle the feeling of hopelessness and being able to do nothing, when it comes to fighting the arms trade and preventing war. It aimed to provide the various ways in which we can contribute to bringing down the arms trade. Amongst the speakers was Lindsey German, from Stop the War. Lindsey spoke of the 2003 anti-war protest against the Iraq War and the mobilisation behind it. Her specific focus on what we should remember with the centenary of the armistice can be found here. Symon Hill from the Peace Pledge Union spoke about the role and importance of disobedience in anti-war campaigning. 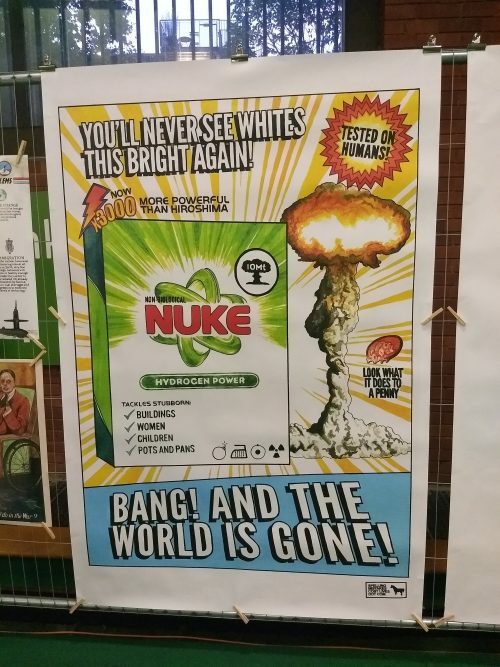 Darren Cullen a satirical artist, illustrator and writer, showed how art and satire could be used in challenging advertisements and the narrative used by the armed forces. In his talk, Darren screened two pieces of his work Empire Air & Action Man: Battlefield Casualties. Darren is a contributor to Art the Arms Fair, and you can see more of his amazing work on his website Spelling Mistakes Cost Lives. Whilst touching on the courage of those who disobeyed in the past, he also spoke of systems upholding militarised spaces, specifically those that prevent people from voicing dissent in today’s society (like the Prevent policy). Veterans for Peace UK also screened a video on the important work they do & why. We were so lucky to be joined by the amazing Rap Club, and their teacher Ben Turner, who through their powerful music and rap uncovered various topics including state violence and persevering at school. CAAT aimed to shed light on the militarisation of our spaces, like public institutions and universities, and discussed how demanding the cutting of ties with the arms trade, is also demanding transparency, accountability and democracy for spaces that are supposedly ours. We touched on the various ways in which institutions were militarised and supporting an arms trade that was upholding various systems of oppression. Crucially, we discussed the importance and power of creative resistance, and reminded attendees of the 2019 court case, and DSEI 2019. 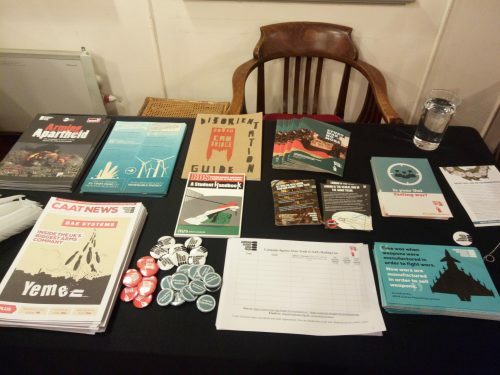 To hear more about events we’ll be at, for campaign updates, more information on how to get involved at your university or at the upcoming DSEI protests, and for CAAT news, please visit our Join Us page.